Little drama accompanied results of the February 17 election in Ecuador, where center-left incumbent Rafael Correa retained the presidency by a wide margin. Correa enjoys the highest approval rating – nearly 80% late last year – of any Latin American head of state. He will be the first Ecuadoran president to complete his term since 1996, and his resounding victory at the polls will in principle keep him in office until 2017. Most pre-election polls had projected Correa to win decisively, and he did just that with 56.7% of the popular vote. The opposition is fractured, with seven different candidates running against him. His nearest rival, banker Guillermo Lasso, garnered only 23.3% of the vote. A testament to Correa’s dominance is that the right-leaning Lasso offered a vision little different from the president’s own policies and even adopted key elements of Correa’s discourse. The title of Lasso’s recent book, Another Ecuador is Possible, references the World Social Forum. 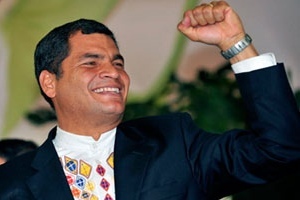 Correa’s political base was consolidated during the anti-neoliberal protests of 2005, and his “citizen’s revolution” represents an unorthodox combination of nationalist populism, robust social welfare spending and rhetorical flourishes in defense of Ecuador’s national sovereignty. Correa’s social spending – increasing the health budget, minimum wage, pensions, and access to medical care; offering micro-credit and free school lunches; providing new housing and anti-poverty subsidies –is highly popular, especially with the urban poor. These programs, dependent upon a commodity-led export strategy, have enabled Correa to marginalize once important political actors of the left and right. Organized labor and indigenous movements on the left, like economic and media elites on the right, have picked fights with Correa, objecting to his authoritarian style, attacks on the press, petroleum policies in the Amazon, poor record on crime, and outbursts directed toward foreign investors. But this has made little dent in his popularity. If Correa is certain to face resistance to his agenda in his new term, the political fragmentation and lack of dramatic choices evident during the campaign suggest that it will not necessarily be effective. Despite potential fiscal headwinds, redistributive social welfare policies are likely to continue to expand. Questions do remain: regular social investment has been enabled by ramping up an extraction-based economy dependent on oil, which has also generated some social conflict. But there is mounting evidence that aside from being popular these policies are also measurably successful. Ecuador’s election comes on the heels of Venezuela’s, where opposition candidates also found it necessary to tout redistributive policies. If the economy turns south, a splintered opposition might find common cause. But as in a number of other South American countries, the redistributive politics of an incipient social welfare state will inform the agenda of Correa’s eventual successor. The long-term management of these policies, and whether the President will seek to alter the Constitution to permit indefinite re-election, are matters that could prove vexing during the coming years. Rob’s commentary certainly sums this issue up well. He provided more context and background for his views on this week’s “Latin Pulse” program.